Robert McCloskey's book "Time of Wonder" is a breath of fresh air. It is a classic picture book that, even though it was first published in 1958, never loses its freshness and joy. "Time of Wonder" is a book about the beauty of the outdoors and the life we weave around the sun, the sky, the sea and the weather. In its 63 pages it reminds us of the smell of rain before it starts to fall, the cold, squishy feeling of wet sand between our toes on a hot summer day, the sound of the wind between the tall pines on a rocky shore, the way the sun shimmers on the bay andthe color of it melting below the horizon. It's a story about a family that spends its summers in a cottage on an island in Maine. The main mode of travel is by boat, be it outboard, lobster boat or sailing dinghy. Clams are often on the menu, freshly dug up from the beach, and everybody knows everybody. It's a story about the way life used to be, when kids could feel free to explore on their own, sailing around the bay for hours, exploring islands, having picnics and jumping off of rocks into salty water. The first time I read "Time of Wonder" I felt a longing for a youth I never had! Not having grown up in Maine, of course, I never even heard of a lobster boat until I became an adult, but I immediately wanted to share this story with my kids. I wanted them to feel that same longing as I did, and want deep down in their hearts to have that kind of fun in their childhood. It is a book for dreamers, for quiet contemplation and admiration of the world around us. "Take a farewell look at the waves and the sky. Take a farewell sniff of the salty sea. A little bit sad about the place you are leaving, a little bit glad about the place you are going. It is a time of quiet wonder- for wondering, for instance: Where do hummingbirds go in a hurricane?" 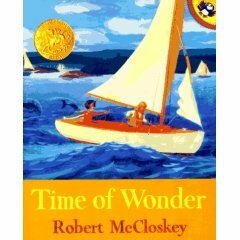 Robert McCloskey illustrated this book himself, and was awarded a Caldecott Medal for his work. I can't recommend it enough! Treat yourself and your family with this book. It is worth it.